Not something you expected to hear from what is possibly the world’s most irate game player. James Rolfe has put out a video of him outside of the role of the Nerd and unscripted describing his memories on playing Sonic the Hedgehog games. Surprise! He states in the video that he has never played a bad Sonic game. If the video is of any indication, he probably stopped playing them after a certain point. 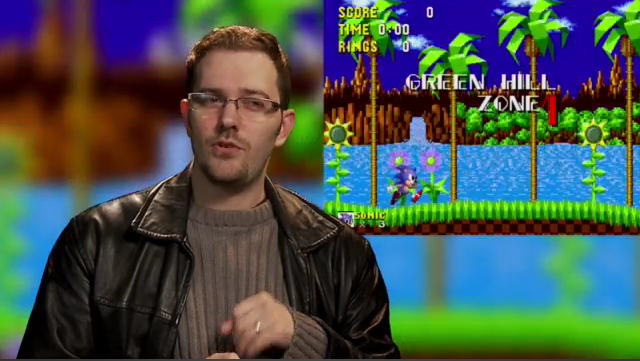 The video covers his fond memories of Sonic 1, 2, 3, Spinball (Briefly) and Sonic CD. Like any enthusiast, one will probably dissect the video and see how his memory stacks up to their own experience with the games. While James recounts his fondest memories from what seems like years that he last played a Sonic game after being introduced to the series by his neighbors, there’s something a bit off from the footage used for the video. If the red number didn’t throw you off, you’ll notice that the font is taken from…Sonic the Hedgehog 2. It’s not supered over the actual game. It’s running in real time. The Nerd is usually known for using actual hardware to play games. No save states. No modifications. Where did this footage come from? The Nerd is at Game Trailers and is probably not compiling the video himself. However, running behind him is footage from what is definitely a modified version of Sonic 1 and most likely through an emulator. Not to over analyze the video, as the other games don’t really have anything that any enthusiast here at Retro would find amiss. Outside of that, the Nerd has some fond memories on Sonic, from the debug mode, the lambasting Tails, up to Sonic CD, using footage from Taxman’s port. (As well as the instrumental version of You Can Do Anything laid for the opening and closing of the video.) Worth a look if you’re into the Angry Video Game Nerd.